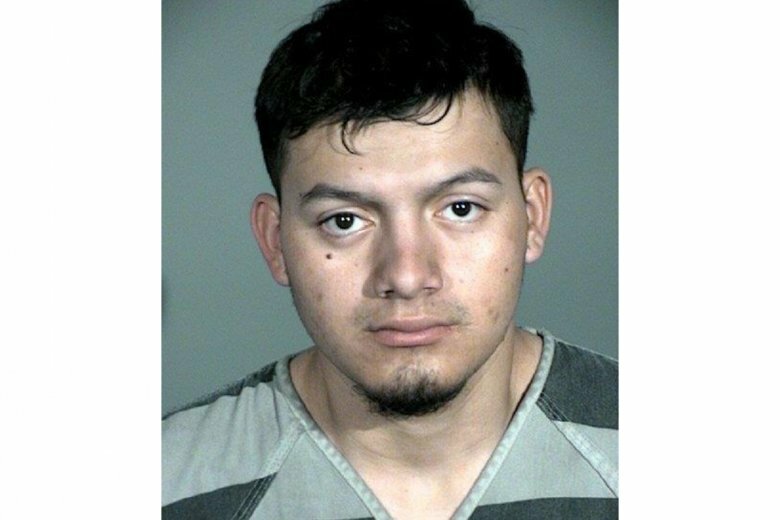 GARDNERVILLE RANCHOS, Nev. (AP) — Prosecutors were preparing Wednesday to charge a 19-year-old man from El Salvador who was living in the U.S. illegally with killing four people in two different Nevada cities, while investigators looked for possible links between the victims and suspect. “They’re continuing to look at, ‘How were these cases connected? '” Carson City Sheriff Ken Furlong said of the separate shootings carried out in a six-day span. Two women were found dead in their homes days apart in the tight-knit community of Gardnerville Ranchos, and the bodies of a couple were discovered in their Reno house about an hour’s drive north. A motive for the slayings is not known. Wilbur Ernesto Martinez-Guzman has been arrested and is expected in court Thursday in Carson City. “I have a hard time believing these were random,” Furlong said. The case became part of the immigration debate after President Donald Trump cited it as evidence of the need for his proposed U.S.-Mexico border wall, which is at the heart of a partial government shutdown. Federal immigration authorities told Furlong that Martinez-Guzman was from El Salvador and in the country illegally. Immigration and Customs Enforcement did not have more details on how he got into the U.S.
Martinez-Guzman is in jail on charges involving stolen property, burglary and immigration. Carson City District Attorney Jason Woodbury said Martinez-Guzman had been selling the victims’ items at pawn shops. He’s expected to have a lawyer appointed Thursday in court but not yet face murder charges. Douglas County District Attorney Mark Jackson said those charges will be filed separately, probably this week. Officials said they were deciding where Martinez-Guzman will be prosecuted because the killings occurred in two counties. In Gardnerville Ranchos, a 30-minute drive south of Carson City, the deaths of 56-year-old Connie Koontz and 74-year-old Sophia Renken have left formerly trusting residents on edge. Koontz was found dead in her home Jan. 10. Renken was found three days later in her house about a mile (1.5 kilometers) away. The scenic valley between snowy mountains is the kind of place where people know their neighbors and walk into each other’s homes without knocking, resident Michael Lucas said. Lucas worked with Koontz at a Walmart and said she was funny, kind and cared for her mother. In the past, he said, few residents would turn on their lights at night but now every house is lit up. Lucas said there are mixed feelings among residents about Trump highlighting the killings. Lucas said he didn’t previously support a border wall but the crimes have made him reconsider. Renken belonged to an antique automobile club, driving a Ford Model A and always volunteering to help people, her friend Robin Reedy said. Next-door neighbor Jim Gibson said he was home but didn’t hear anything unusual the night authorities believe Renken was killed. “I didn’t leave the house for five or six days,” Gibson said, characterizing his home as “pretty much on lockdown” with new security alarms, floodlights and a camera. Neighbors are nervous, he said, because police have released few details about the crimes, including information about how someone entered the victims’ homes. Gerald David, 81, and his 80-year-old wife, Sharon, were found dead in their south Reno home Jan. 16. Longtime friend Tom Cates remembered the couple as active figures in the rodeo and equestrian scene.